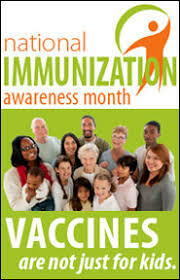 Every year in August, National Immunization Awareness Month (NIAM) provides an opportunity to raise awareness of the importance of immunization and the need for improving national vaccination coverage levels. NIAM is co-sponsored by the National Public Health Information Coalition (NPHIC) and CDC. The third week, August 19–25, focuses on vaccinations for preteens and teens. The theme for the week is "Ensure a healthy future with vaccines." The 2018 edition of the communications toolkit, put out by NPHIC in collaboration with CDC, contains key messages, vaccine information, sample news releases and articles, sample social media messages, links to web resources from CDC and other organizations, and logos, web banners, posters, and graphics to use with social media. The website also includes a place for you to share your NIAM activities and view what others are doing for NIAM, using the hashtag #NIAM18. Previous weeks of NIAM focused on getting ready for back to school, pregnant women, and babies and young children. The final week will focus on adult immunization. Technically Speaking, a monthly column written by IAC executive director Dr. Deborah Wexler, is featured in Children's Hospital of Philadelphia's Vaccine Education Center (VEC) monthly e-newsletter for healthcare professionals. Her most recent column on the hepatitis B vaccine birth dose is reprinted below. The American Academy of Family Physicians (AAFP), American Academy of Pediatrics (AAP), and American College of Obstetricians and Gynecologists (ACOG) are all in agreement with the recommendation to vaccinate newborns within 24 hours of birth. AAP included this in its recently published Red Book 2018–2021: Report of the Committee on Infectious Diseases (page 421, Table 3.24). Access the entire hepatitis B birth dose Technically Speaking article which also provides links to many useful resources from IAC, CDC, and VEC. You can access the current and past issues of Technically Speaking from a box in the middle of the Immunize.org home page, from the "Guide to immunize.org" at the bottom of every web page, or by going directly to www.immunize.org/technically-speaking. Check out the July 2018 issue of VEC's Vaccine Update for Healthcare Providers. The VEC e-newsletter keeps providers up to date on vaccine-related issues and includes reviews of recently published journal articles, media recaps, announcements about new resources, and a regularly updated calendar of events. To subscribe to this newsletter, go to the sign-up form. IAC's Google Search engine on immunize.org is a fast way to find whatever you are looking for on the IAC website. Located in the upper right-hand corner of every page, this function searches the entire IAC website for whatever you're looking for in your search. It's the quickest way to find what you need! Try out the Google Search engine in the upper right-hand corner of any immunize.org web page today. IAC recently developed and posted its newest PowerPoint slide set, What Are Standing Orders Protocols? This 53-slide set also includes speaker’s notes explaining standing orders for immunization and describing how they can help increase immunization coverage rates. The slide set presents an overview of factors contributing to low vaccination rates, essential components of standing orders, and how standing orders benefit medical practices, as well as links to additional IAC resources on standing orders. There are two additional PowerPoint slide sets available to help you implement standing orders for adults. To obtain all PowerPoint slide sets, go to IAC's PowerPoint Slide Sets web page. Just below the presentation's title and description, click on "Request the PowerPoint slide set" and IAC will email the PowerPoint presentation to you. Once you have received the presentation, you can edit and use it as you see fit. Paul Offit, MD, director, Vaccine Education Center at Children's Hospital of Philadelphia, as well as the Maurice R. Hilleman Professor of Vaccinology and professor of pediatrics at the Perelman School of Medicine at the University of Pennsylvania, has written a new book titled Bad Advice: Or Why Celebrities, Politicians, and Activists Aren’t Your Best Source of Health Information. A selection from a description of the book from Dr. Offit's website is reprinted below. Science doesn’t speak for itself. Neck-deep in work that can be messy and confounding, and naive in the ways of public communication, scientists are often unable to package their insights into the neat narratives that the public requires. Enter the celebrities, the advocates, the lobbyists, and the funders behind them, who take advantage of scientists’ reluctance to provide easy answers, flooding the media with misleading or incorrect claims about health risks. Amid this onslaught of spurious information, Americans are more confused than ever about what’s good for them and what isn’t. The book can be purchased through Dr. Offit's website (click on the images at the bottom of the page); from the publisher, Columbia University Press; or through your favorite bookstore or seller. There are now 677 organizations enrolled in IAC's Influenza Vaccination Honor Roll. The honor roll recognizes hospitals, medical practices, professional organizations, health departments, and government entities that have taken a stand for patient safety by implementing mandatory influenza vaccination policies for healthcare personnel. Since July 5, when IAC Express last reported on the Influenza Vaccination Honor Roll, three additional healthcare organizations have been enrolled. IAC recently updated its four temperature logs for healthcare professionals to help with safe vaccine storage and handling. Changes were made to the instructions for recording daily temperatures. IAC’s frequently downloaded temperature logs for refrigerators and freezers are widely used to help clinics monitor and document the temperature readings within vaccine storage units. Below are the updated logs. IAC recently revised its "Vaccine Storage Troubleshooting Record" to allow healthcare personnel to record their notes about reportable events that occurred in vaccine storage. These forms can be used to document any unacceptable vaccine storage event, such as exposure of refrigerated vaccines to temperatures that are outside the manufacturers' recommended storage ranges. IAC's non-fillable format offers examples of completed records, including the actions taken. The fillable format allows users to document electronically or by hand. Below are the updated tools. WHO's Weekly Epidemiological Record published an article titled Yellow fever in Africa and the Americas, 2017. The first paragraph is reprinted below. In 2017, there were major yellow fever (YF) outbreaks in Brazil and Nigeria. These outbreaks were not marked by the rapid urban spread seen in 2016 in Angola and the Democratic Republic of the Congo (DRC), yet they illustrate the increased risk of YF and urban outbreaks with international spread. The Eliminate Yellow Fever Epidemics (EYE1) strategy was developed with the goal to reduce the risk of YF through a continuum ranging from outbreak detection and response, to prevention. On July 28, Clinical Infectious Diseases published Mortality among Patients with Chronic Hepatitis B (CHB) Infection: The Chronic Hepatitis Cohort Study (CHeCS) (D Bixler et al.). The abstract's conclusion is reprinted below. Compared to the general population, CHB patients die at a younger age and at higher rates from all causes and liver-related causes. Death certificates underrepresent the true mortality from CHB. Access the abstract: Mortality among Patients with Chronic Hepatitis B (CHB) Infection: The Chronic Hepatitis Cohort Study. Join CDC on August 17 at 1:00 p.m. (ET) for the next #PreteenVaxScene webinar, National Immunization Awareness Month: Effectively Recommending Vaccines Across the Lifespan. This webinar will feature two practicing family physicians, both recently recognized as CDC Childhood Immunization Champions, who will discuss how they talk about vaccines and address common questions for all of their patients. CDC is presenting a 15-part webinar series to provide a chapter-by-chapter overview of the 13th edition of Epidemiology and Prevention of Vaccine-Preventable Diseases (also known as "The Pink Book"). This is a live series of weekly 1-hour webinars that started June 6 and will run through September 26. The webinar series provides an overview of vaccines and the diseases they prevent, general recommendations for vaccines, vaccination principles, and immunization strategies for providers. The August 22 webinar will cover "Polio and Hib" and include a live Q&A session. Recordings of sessions will be available online within 2 weeks after each webinar. All sessions begin at 12:00 p.m. (ET). Free continuing education is available for healthcare personnel including physicians, nurses, nurse practitioners, pharmacists, physician’s assistants, and others. What Is HPV? This short video for teen audiences by Kerry Harper is one of the finalists in the "Protect Me With 3+" video contest in New Jersey. HPV is a group of viruses that affects both boys and girls. Kerry tells us that every 20 minutes one person in the U.S. gets a cancer from HPV. Kerry encourages students to talk to their parents about getting the HPV vaccine.